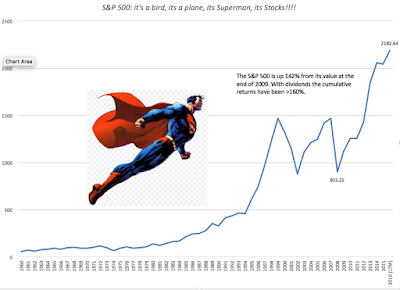 Musings on Markets: Superman and Stocks: It's not the Cape (CAPE), it's the Kryptonite(Cash flow)! 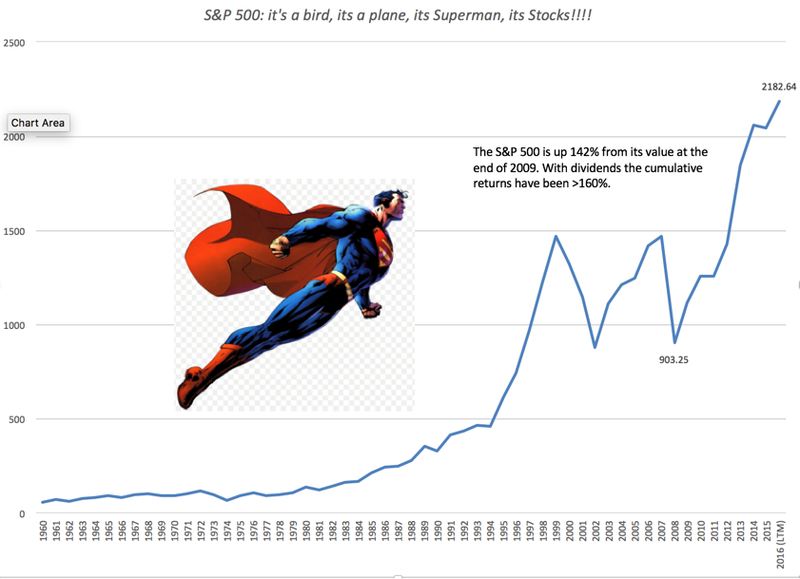 Superman and Stocks: It's not the Cape (CAPE), it's the Kryptonite(Cash flow)! Just about a week ago, I was on a 13-hour plane trip from Tokyo to New York. I know that this will sound strange but I like long flights for two reasons. The first is that they give me extended stretches of time when I can work without interruption, no knocks on the door or email or phone calls. I readied my lecture notes for next semester and reviewed and edited a manuscript for one of my books in the first half on the trip. The second is that I can go on movie binges with my remaining time, watching movies that I would have neither the time nor the patience to watch otherwise. On this trip, however, I made the bad decision of watching Batman versus Superman, Dawn of Justice, a movie so bad that the only way that I was able to get through it was by letting my mind wander, a practice that I indulge in frequently and without apologies or guilt. I pondered whether Superman needed his suit or more importantly, his cape, to fly. After all, his powers come from his origins (that he was born in Krypton) and not from his outfit and the cape seems to be more of an aerodynamic drag than an augmentation. 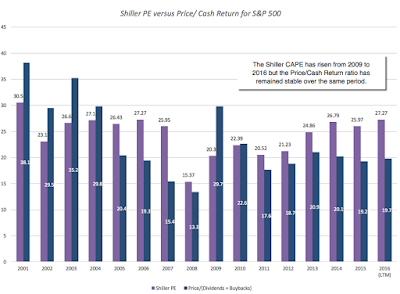 These deep thoughts about Superman's cape then led me to thinking about CAPE, the variant on PE ratios that Robert Shiller developed, and how many articles I have read over the last decade that have used this measure as the basis for warning me that stocks are headed for a fall. Finally, I started thinking about Kryptonite, the substance that renders Superman helpless, and what would be analogous to it in the stock market. I did tell you that I have a wandering mind and so, if you don't like Superman or stocks, consider yourself forewarned! As stocks hit one high after another, the stock market looks like Superman, soaring to new highs and possessed of super powers. One of the primary weapons that rational bubblers use to back up their case is the Cyclically Adjusted Price Earnings (CAPE), a measure developed and popularized by Robert Shiller, Nobel prize winner whose soothsaying credentials were amplified by his calls on the dot com and housing bubbles. For those who don’t quite grasp what the CAPE is, it is the conventional PE ratio for stocks, with two adjustments to the earnings. First, instead of using the most recent year’s earnings, it is computed as the average earnings over the prior ten years. Second, to allow for the effects of inflation, the earnings in prior years is adjusted for inflation. 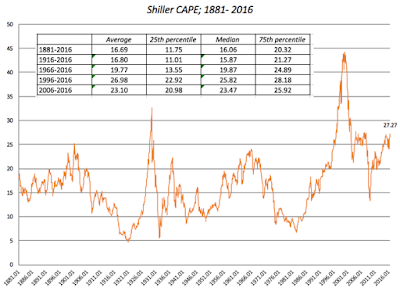 The CAPE case against stocks is a simple one to make and it is best seen by graphing Shiller’s version of it over time. The current CAPE of 27.27 is well above the historic average of 16.06 and if you buy into the notion of mean reversion, the case makes itself, right? Not quite! As you can see, even within the CAPE story, there are holes, largely depending upon what time period you use for your averaging. Relative to the fully history, the CAPE looks high today, but relative to the last 20 years, the story is much weaker. Contrary to popular view, mean reversion is very much in the eyes of the beholder. 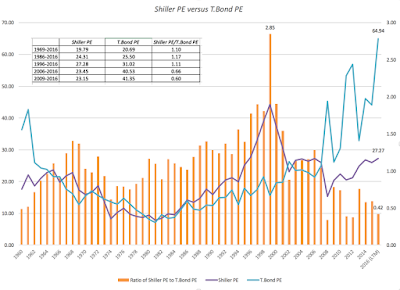 Robert Shiller has been a force in finance, forcing us to look at the consequences of investor behavior and chronicling the consequences of “irrational exuberance”. His work with Karl Case in developing a real estate index that is now widely followed has introduced discipline and accountability into real estate investing and his historical data series on stocks, which he so generously shares with us, is invaluable. You can almost see the “but” coming and I will not disappoint you. Of all of his creations, I find CAPE to be not only the least compelling but also potentially the most dangerous, in terms of how often it can lead investors astray. So, at the risk of angering those of you who are CAPE followers, here is my case against putting too much faith in this measure, with much of it representing updates of my post from two years ago. The notion that CAPE is a significant improvement on conventional PE is based on the two adjustments that it makes, first by replacing earnings in the most recent period with average earnings over ten years and the second by adjusting past earnings for inflation to make them comparable to current earnings. Both adjustments make intuitive sense but at least in the context of the overall market, I am not sure that either adjustment makes much of a difference. In the graph below, I show the trailing PE, normalized PE (using the average earnings over the last ten years) and CAPE for the S&P 500 from 1969 to 2016 (last twelve months). I also show Shiller's CAPE, which is based on a broader group of US stocks in the same graph. 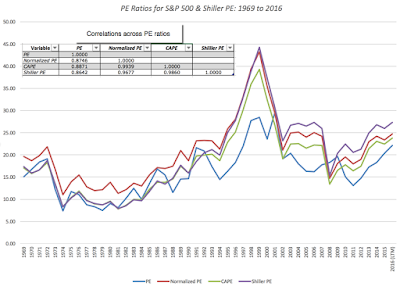 First, it is true that especially after boom periods (where earnings peak) or economic crises (where trailing earnings collapse), the CAPEs (both mine and Shiller's) yield different numbers than PE. Second, and more important, the four measures move together most of the time, with the correlation matrix shown in the figure. 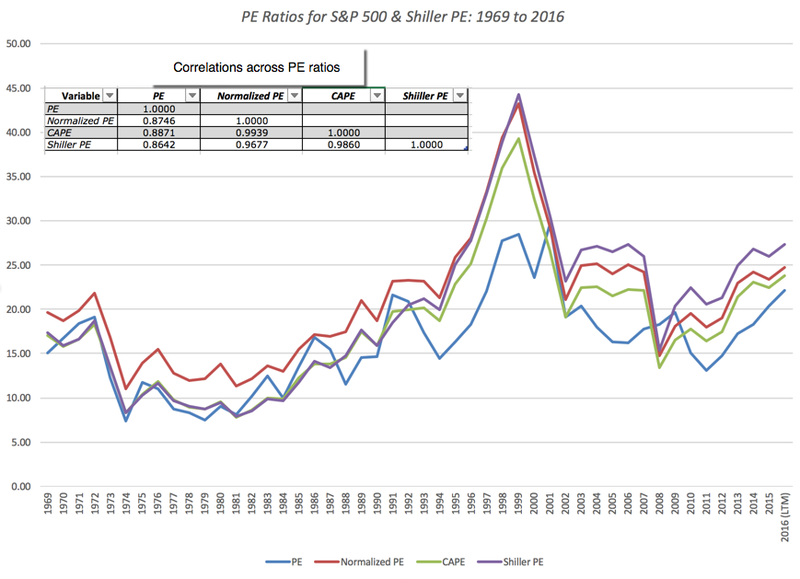 Note that the correlation is close to one between the normalized PE and the CAPE, suggesting that the inflation adjustment does little or nothing in markets like the US and even the normalization makes only a marginal difference with a correlation of 0.86 between the unadjusted PE and the Shiller PE. There is both good news and bad news for those who use the Shiller CAPE as their stock valuation metric. The good news is that the fundamental proposition that stocks are more likely to go down in future periods, if the Shiller CAPE is high today, seems to be backed up. The bad news is two fold. First, the relationship is noisy or in investment parlance, the predictive power is low, especially with one-year returns. 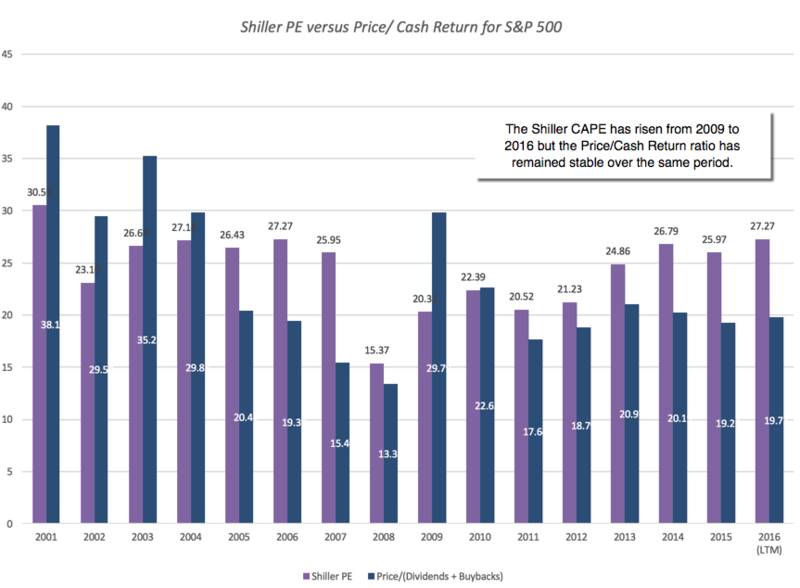 Second, the trailing PE actually does a better job of predicting one-year returns than the CAPE and while CAPE becomes the better predictor than trailing PE over a five-year period, it is barely better than using a dividend yield indicator. While I have not included these in the table, I will wager that any multiple (such as EV to EBITDA) would do as good (or as bad, depending on your perspective) a job as market timing. Note that as you trust CAPE more and more (using lower thresholds and adjusting your equity allocation more), you do more and more damage to the end-value of your portfolio. The bottom line is that it is tough to get a payoff from market timing, even when the pricing metric that you are using comes with impeccable credentials. 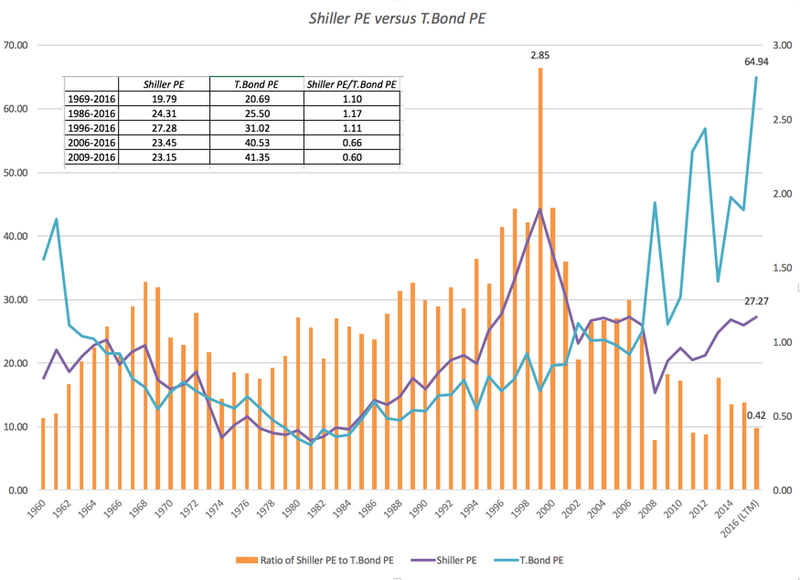 I also compute a ratio of stock PE to T.Bond PE that will use as a measure of relative stock market pricing, with a low value indicating that stocks are cheap (relative to T.Bonds) and a high value suggesting the opposite. As you can see, bringing in the low treasury bond rates of the last decade into the analysis dramatically shifts the story line from stocks being over valued to stocks being under valued. The ratio is as 0.42 right now, well below the historical average over any of the time periods listed, and nowhere near the 1.91 that you saw in 2000, just before the dot com bust or even the 1.04 just before the 2008 crisis. Here again, there seems to be a disconnect. While the CAPE has risen for the market, from 20.52 in 2009 to 27.27 in 2016, as stocks soared during that period, the Price to CF ratio has remained stable over that period (at about 20), reflecting the rise in cash returned by US companies, primarily in buybacks over the period. Am I making the case that stocks are under valued? If I did, I would be just as guilty as those who use CAPE to make the opposite case. I am not a market timer, by nature, and any single pricing metric, no matter how well reasoned it may be, is too weak to capture the complexity of the market. Absolutism in market timing is a sign of either hubris or ignorance. At this point, if you think that I am sanguine about stocks, you would be wrong, since the essence of investing in equities is that worry goes with it. If it’s not the high CAPE that is worrying me, what is? Here are my biggest concerns, the kryptonite that could drain the market of its strength and vitality. The Treasury Alternative (or how much are you afraid of your central bank?) If the reason that you are in stocks is because the payoff for being in bonds is low, that equation could change if the bond payoff improves. If you are Fed-watcher, convinced that central banks are all-powerful arbiters of interest rates, your nightmares almost always will be related to a meeting of the Federal Open Market Committee (FOMC), and in those nightmares, the Fed will raise rates from 1.50% to 4% on a whim, destroying your entire basis for investing in stocks. As I have noted in these earlier posts, where I have characterized the Fed as the Wizard of Oz and argued that low rates are more a reflection of low inflation and anemic growth than the result of quantitative easing, I believe that any substantial rate rises will have to come from shifts in fundamentals, either an increase in inflation or a surge in real growth. Both of these fundamentals will play out in earnings as well, pushing up earnings growth and making the stock market effect ambiguous. In fact, I can see a scenario where strong economic growth pushes T. bond rates up to 3% or higher and stock markets actually increase as rates go up. The Earnings Hangover It is true that we saw a long stint of earnings improvement after the 2008 crisis and that the stronger dollar and a weaker global economy are starting to crimp earnings levels and growth. Earnings on the S&P 500 dropped in 2015 by 11.08% and are on a pathway to decline again this year and if the rate of decline accelerates, this could put stocks at risk. That said, you could make the case that the earnings decline has been surprisingly muted, given multiple crises, and that there is no reason to fear a fall off the cliff. No matter what your views, though, this will be more likely to be a slow-motion correction, offering chances for investors to get off the stock market ride, if they so desire. In 2015, companies in the S&P 500 collectively returned 105.59% of their earnings as cash flows. While this would not be surprising in a recession year, where earnings are depressed, it is strikingly high in a good earnings year. Through the first two quarters of 2016, companies have continued the torrid pace of buybacks, with the percent of cash returned rising to 112.18%. The debate about whether these buybacks make sense or not will have to be reserved for another post, but what is not debatable is this. Unless earnings show a dramatic growth (and there is no reason to believe that they will), companies will start revving down (or be forced to) their buyback engines and that will put the market under pressure. (For those of you who track my implied equity risk premium estimates, it was this concern about cash flow sustainability that led me to add the option of allowing cash flow payouts to adjust to sustainable levels in the long term). So, how do these worries play out in my portfolio? They don’t explicitly but they do implicitly affect my investment choices. I cannot do much about interest rates, other than react, and I will stay ready, especially if inflation pressures push up rates and the fixed income market offers me a better payoff. With earnings and cash flows, there may be concerns at the market level, but I bet on individual companies, not markets. With those companies, I can do my due diligence to make sure that they have the operating cash flows (not just dividends or buybacks) to justify their valuations. If that sounds like a pitch for intrinsic valuation, are you surprised? Will there be a market correction? Of course! When it does happen, don't be surprised to see a wave of “I told you so” coming from the bubblers. A clock that is stuck at 12 o'clock will be right twice every day and I would urge you to judge these market timers, not on their correction calls, which will look prescient, but on their overall record. Many of them, after all, have been suggesting that you stay out of stocks for the last five years or longer and it would have to be a large correction for you to make back what you lost from staying on the sidelines. Some of these pundits will be crowned as great market timers by the financial press and they will acquire followers. I hope that I don’t sound like a Cassandra but this much I know, from studying past history. Most of these great market timers usually get it right once, let that success get to their heads and proceed to let their hubris drive them to more and more extreme predictions in the next cycle. As an investor, my suggestion is that you save your money and your sanity by staying far away from market prognosticators. AMAZING post! This is the most rational critique of the CAPE I have read. One question: how much does the CAPE improve at predicting future returns if you look a full 10 years out as opposed to just 1 and 5 years out? Based on Hussman's work, it seems that CAPE does correlate better to 10 year returns. Obviously, CAPE doesn't help much with investment decision-making even if the above holds true. Would you really use P/(Div+buybacks) as a good example to predict the market though? Looking at your data, the ratio was at a low in 2007/2008 and I should have invested? Can you clarify if/when using that metric is actually useful? Great post! I also watched Batman V Superman on a plane recently and was not a fan. I distracted myself by writing down all of my complaints to share with my friends. Possibly not as productive a use of time as your response. Easy question first. I am not a market timer and I behave consistently. I don't use any ratios to predict the market because I am convinced that none of them work. I will try to do the 10-year forecast but let's assume that it does much better. What exactly are we to do with that forecast? Stay out of the market for the next 10 years? The costs of staying out of the market increase with your market timing horizon. So, you would need almost perfect market timing for a 10-year forecast to work. Hi professor aswath, a couple of questions on the post. Do you have the payout % of dividend and buyback vs. the FCFE? Cos earnings is not really the available cash to equity holders. Also, for the price/ cash return ratio, should an adjustment be made for stock issuance? One question, why did you use 1927 as your starting point for the $100 invested? Curious about your conclusion that "In 2015, companies in the S&P 500 collectively returned 105.59% of their earnings as cash flows. While this would not be surprising in a recession year, where earnings are depressed, it is strikingly high in a good earnings year." To me, it doesn't seem too surprising based on the past data you present. Your data show earnings down about 6% y/y in 2007, but still elevated, and that was a year with a triple-digit cash-payout percentage. And as the US recession began in Dec.07, I wouldn't call '07 a recession year. It seems like a pretty similar case in 2015, with earnings down 11% and the cash payout percentage again in triple digits. Just making sure that I'm not misunderstanding something, but it seems like cash payouts simply accelerate to super-high levels as *expansions* get long in the tooth, and then to the extent that you see a continued high percentage in recession years (ie 2008), it's likely just a hangover of companies using up existing buyback authorizations. Mostly this is the difference between 2015 being "surprising" in this regard versus it being "predictable", but I don't think it impacts your thesis or takeaways more broadly. Also, I'll +1 to the question above from John Wang -- "for the price/ cash return ratio, should an adjustment be made for stock issuance?" Since E/P is generally a more effective factor than its more popular inverse (P/E); I'm wondering if you examined this issue using the inverse of the CAPE - i.e. CAEP or 1/CAPE? In defense of CAPE: I think that your backtest is a little unfair. You use annual investment decisions (ie. market-timing), even though you showed earlier that the signal is useless on a one-year time-horizon. I doubt that Price/(buyback+dividend) shows better statistics if tested the same way. If you use shiller's data set and simply plot valuation vs. forward returns you will see that the r² improves with time-Frame and is significant! Sidenote: if you add the level of long-term interest rates and compute yield-gaps the relationship worsens! may I ask you where did you get (source) the $ buyback of the S&P ? where do you find $ buyback amount for the S&P500? 1. Is your concern with CAPE specifically or valuation metrics in general as an approach to time investing decisions? As much research has demonstrated, same/similar decisions would be reached using P/B, P/S (the median SP500 stock’s price to sales is 2x the long-term average), EBITDA/EV, or GDP/Total Makt Capitalization (Buffet’s preferred valuation metric). All of these indicate the SP500 is currently overvalued. Hussman thinks we’re in bubble territory, but Grantham, Faber, et al. think the US stock market is quite overvalued – but not enough to sell. My sense is that you think that using market valuation, instead of stock valuation, to guide investing decisions in a bad approach. Could you clarify if your concern is with all valuation metrics or just CAPE? 2. To me, the utility of valuation metrics is setting expectations about future returns. The research I’ve seen for stock price and profit margin mean-reversion is convincing: high current valuations forecast low returns over 7 to 12 year horizons. Research Affiliates, Hussman, Starr, Faber, et al. forecast real SP500 returns of -1% to 4% over the next decade (+/-). To get there – assuming companies continue to grow earnings, stock prices have to fall, probably by 50% or more. Don’t you think that investors should consider how they would respond to that valuation-predicted outcome – think of the dot com and housing/financial crashes of the past decade. If investors couldn’t hold on through 50% to 70% portfolio declines (which is most of them), shouldn’t they be taking action now (hedging, derisking, shifting from US to foreign equities, moving to cash, etc.)? We’ve seen the air pockets caused by everyone rushing to the exits when overvalued markets deflate. Unless you believe that this time is truly different? 3. I think staying the course with US equities versus shifting to low-yielding bonds is a false dichotomy. Faber, RA, and Starr recommend global asset allocations that take advantage of cheaply priced emerging market stocks and fairly valued developed market stocks. One does not have to forgo equity risk premia because US equities are overvalued. Or, do you think US investors should limit their portfolios to US stocks? 4. I completely agree with the Kryptonite you identify, and I’d add shaky global financial institutions that haven’t fully recovered from 2008 and now struggling with NIRP and geopolitical hotspots everywhere, including LEAVE movements in EU countries. Complacent investors are attending to none of these risks at the moment, but history shows that once they do, they will become all-consuming – with resulting panic selling. 5. Lastly, I’ll pose two questions that sort of get at all of the preceding: Suppose you inherited $1 million today. How much of it would you invest in US equities immediately? Suppose you have a $1 million portfolio today allocated 60% to US stocks (ITOT or VTI) and 40% to US fixed income. Would you make any changes based to it because US equities are currently overvalued? Thank you in advance for responding and great blogs. I’ve learned much about valuation from you. First, focusing on any one metric (whether it be CAPE, PBV or EVEBITDA) without considering the alternatives is dangerous and especially so in market timing. So, I would have the same problem if you told me a story with EV/EBITDA for the market at its core instead of CAPE. Second, if all your using the metric for is to become more realistic about future return expectations and those realistic returns make you also more sensible in your saving/investment decisions, I am all for it. Thus, if you are a 30-year old, the fact that the CAPE is high (and that returns over the next 10 years will be lower) should factor into how much you should be saving for your retirement (probably more than you had planned on originally). Third, it is true that I made it a choice between stocks and T.Bills, but in the highly correlated world we live in, when the CAPE is higher than historical values in the US, the same is often true for other stock markets in the world, but I think it is worth a shot. On the final question, and this is really the crux, if my risk aversion and liquidity needs put me in a 60/40 mix, I would not alter it and that is consistent with my investment philosophy of not timing markets. I am a stock picker and I will try to find stocks that deliver the cash flows that I need to sustain myself through the ten years in market wilderness if need be. Professor-- Thanks for the excellent piece. I must confess, I wrote a piece for my firm two years ago titled "CAPE-Useful for Superman, Not So Useful for Investors." Like you, I think "market aggregate" indicators are useless, and I have commented that CAPE has cost more people more money than any other thing because of its esteemed source and its simplicity. But it makes no sense on real examination. In my view, Shiller is no different than the market timers that get it right once--that being his excellent work on housing. I have half joked that they should revoke his Nobel Prize for CAPE. Oddly, I don't think you address my largest complaint about CAPE and I am curious as to your thoughts on the following: The CAPE proponents stand on the reversion to the long term mean. But the S&P 500 universe has a very strange history through most of the past 100 years-- excluding many industries and companies for much of that time. There weren't even 500 stocks in it until 1957! Also, the nature of the companies has changed so dramatically, as you write about frequently. Is today's economy of service and intellectual property companies really comparable to that of 2006 or 1996, not to mention 1936? I don't think so at all. So to lump the data together and claim the long run average is meaningful as a potential mean strikes me as simply ridiculous. I read your blog because of the superb analysis of companies and industries, which is the only real way to be a successful investor. Thanks so much for your work! I hope your incoming Stern students enjoy your classes as much as I did. CAPE's future track record simply will not hold up to its past record. The key reason here being the US economy is no longer a cyclical manufacturing-based economy. Think about this at the individual stock level. Using average 10 earnings to value a company might make sense on a steel or oil company, but would you really use say a growth stock like Visa's EPS 5 years back for the "E" in the equation? That would be ridiculous. Now ask yourself what type of companies are most heavily weighted in the S&P 500... It's a secular bull ride with the occasional shock/recession. Characteristics not fit for CAPE. Almost every time CAPE got widly extended from historical norms pundits came up with a 'new normal' valuation method of understanding the markets. Studies clearly show when CAPE is between 24-28 the expected returns are circa 3% pa over the next 15 years. Now if you are taking 17-18% volatility to make 3% and hope your stock selection methods will 'shield' you that is not good risk management. Bonds are terrible yes, hedge funds too, but your alternative to Bonds is infrastructure which offers higher expected returns than equities with far less volatility for what is still an immature asset class. If you watch Buffet carefully his cash and cash equivalents are rocketing to circa 70B which is basically passively bearish and he's allocating more capital to infrastructure projects. It naturally hedges against downturns in equity markets due to its lower correlation (.37) to equities (unlisted). The really smart investors like Buffet are using infrastructure plays in place of bonds. 5) 2016--Fed Money Printing and Low Rates?? Comparing T.Bond P/E to CAPE is comparing apples to elephants. The bond "earnings" is an automatic cash flow. And only a small sliver of company earnings will flow to stockholders. Still an interesting way to think about it though.